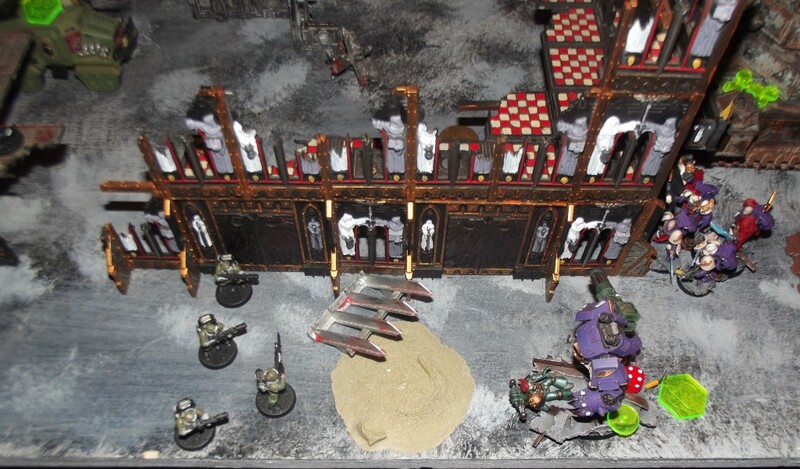 Chaos gets 1 victory point for each building they set alight and 2 victory points for destroying any structures in the enemy deployment zone. Chaos may use a lord of war. Imperial forces get free ammo dumps (Re-roll 1’s to hit for occupying infantry units) in the buildings wholly within their deployment zone (but these buildings may explode if lit, on a 6+ at the end of each turn. This destroys the building and hits each model within with a str 6 ignores cover hit, vehicles are hit on their rear armour.). Onslaught attack, slay the warlord, price of failure. An attacking unit (cannot be a vehicle unless said vehicle is armed with a flamer type weapon or is carrying troops with flamer weapons) that ends its movement phase within range with a flamer or template weapon can use it to set a single building alight (this is done instead of shooting normally, they cannot assault after doing this.). 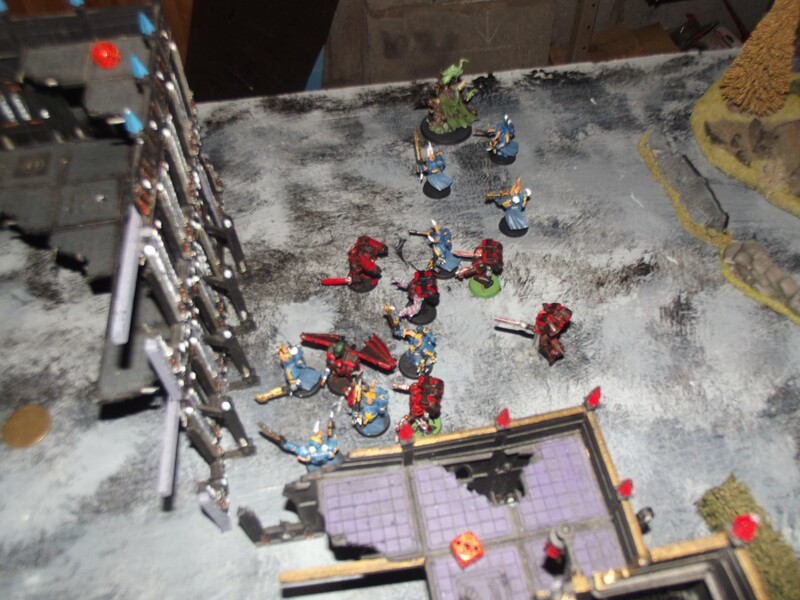 An ablaze building becomes dangerous terrain and blocks line of sight being drawn through it. Models within the ruin now gain the stealth USR but suffer –1 BS. At the end of each subsequent turn each unit within a burning building suffers D6 str 3 ap- hits which are randomly allocated. Once exploded buildings are destroyed and replaced with a piece of rubble. A Lord of war can ram a ruin by moving into contact with it, Roll a D6 on a 3+ the building collapses counting as destroyed but units within only suffer a single str 4 AP- hit each. On a roll of 1 the Lord of war hits something that it cannot smash through and it suffers 1 hull point of damage. Note: if an enemy unit is within 6″ you cannot choose to burn a building. If they are in a building and you target it with a flamer type weapon the building is ignited on a roll of 3+. List unchanged since last used. 1 6 man scion command squad sergeant has bolt pistol. List unchanged since last time. 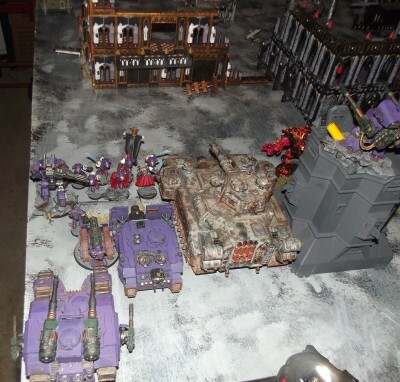 Legion baneblade, Lascannon and twin heavy flamer sponsons with legion crew. 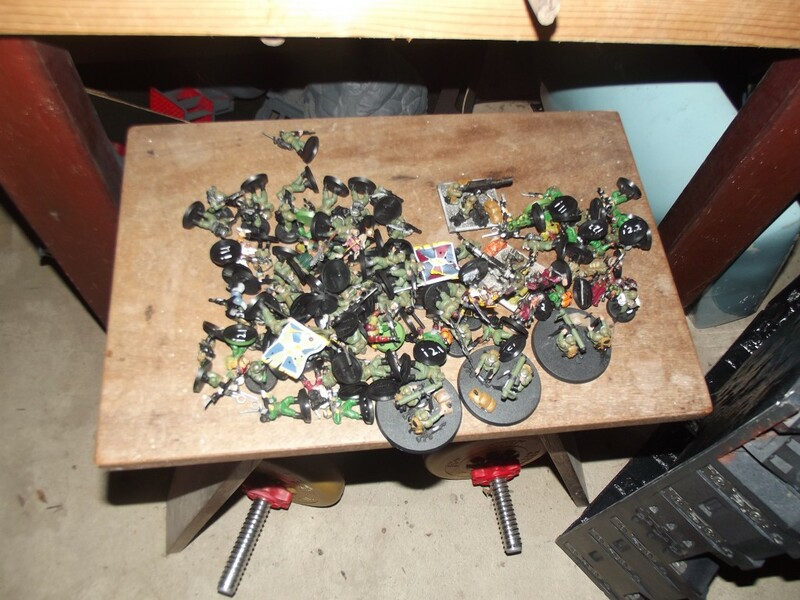 The unbranded – 2 6 man Chaos space marines all with ccw and bolt pistol, 1 flamer per squad, 1 aspiring champion with power fist, 1 aspiring champion with chainsword. 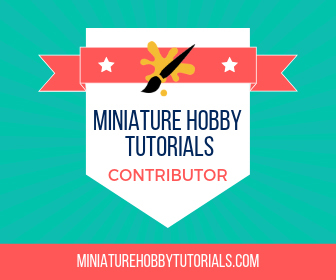 Decimator daemon engine – Two siege claws with heavy flamers. Lord commander Solomon Gyre read over the missive that had been delivered to him and sighed. The nurgle follower who had handed it to him was presently destroying the silken rugs of his camp with his mere presence. “So we are to strike this location and burn it to the ground?” He asked. “Leave me I need to prepare my forces” Gyre adds shooing off the nurgle warrior who left a trail of unidentifiable secretions behind him as he left. 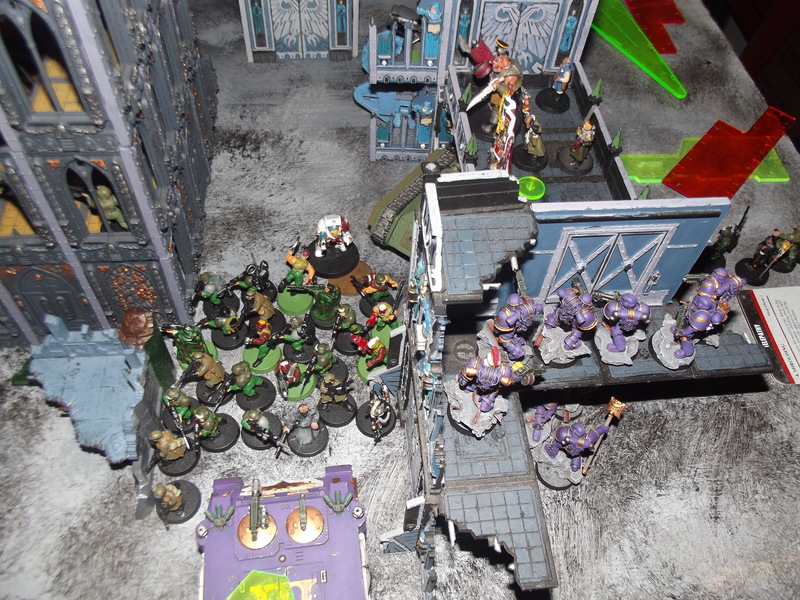 Gyre summoned a squad of his marines. Cavros Thawne was overseeing the final shipment of materials to allow for guerrilla actions to begin once the forces of chaos moved through the cities towards Altum. An enemy thunderhawk transporter in the colours of the Emperors children flew around the city’s outskirts before it dropped off a bastion. Thawne grabbed the spotting magnoculars from his master of ordinance and looked out into the area beyond the city. 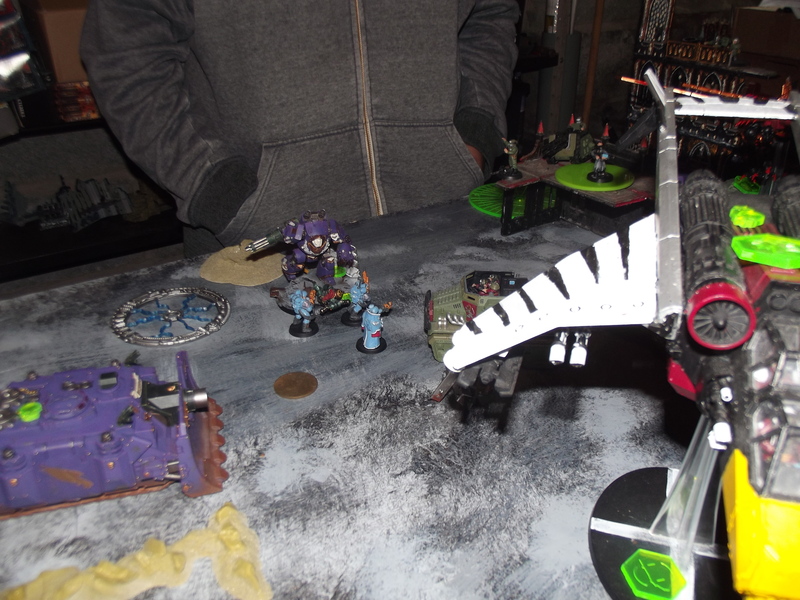 His eyes picked out the approaching enemy forces and the baneblade that was in close attendance. 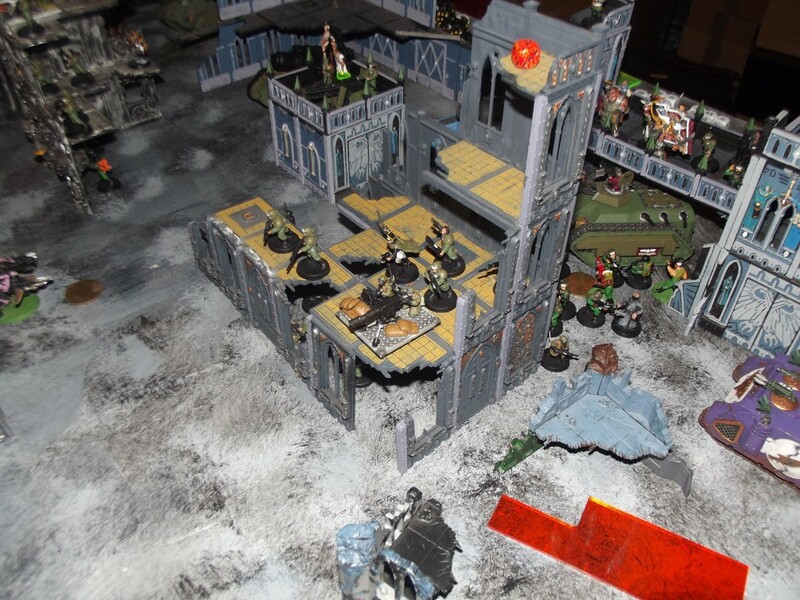 The imperial guard are placed to take advantage of their re-rolls. 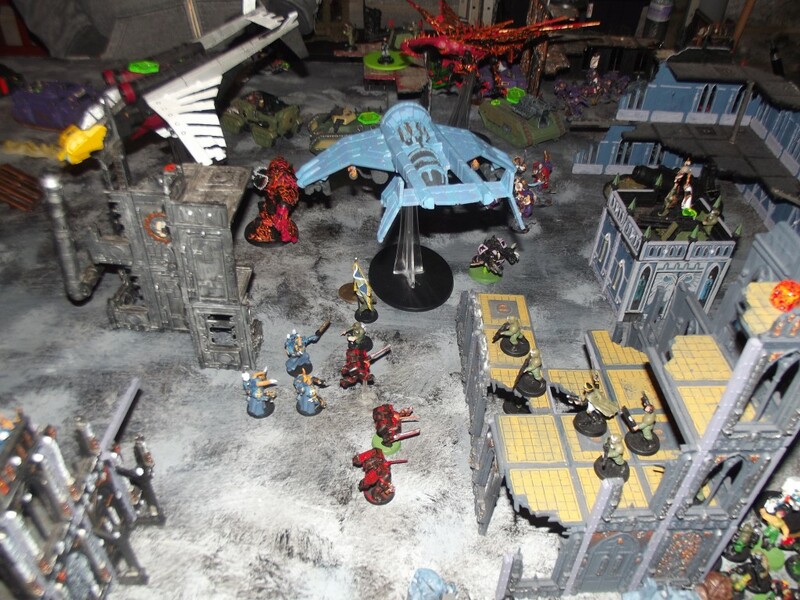 The meltagun special weapon team is in the chimera on the far left. The other two are empty. 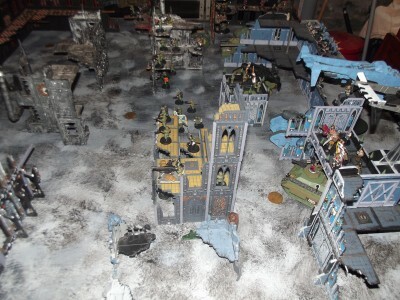 In reserve, we have the two flyers Vendetta and vulture as well as an infantry platoon [command squad, 2 squads], a 50 man conscript squad, an inquisitor, a Culexus assassin, all three squads of scions and three drop sentinels. 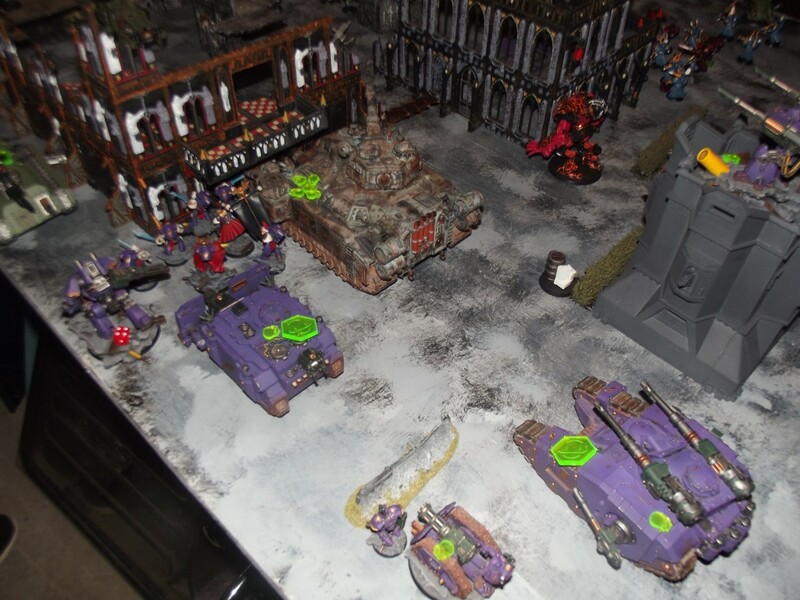 The chaos space marines are poised to charge down the right flank while the emperors children castle up around their Baneblade. The Decimator joins them while we joked about how the deredeo found its way onto the bastion and how it would get down afterwards. Two veteran tactical squads and their rhinos are in reserve and ready to outflank. 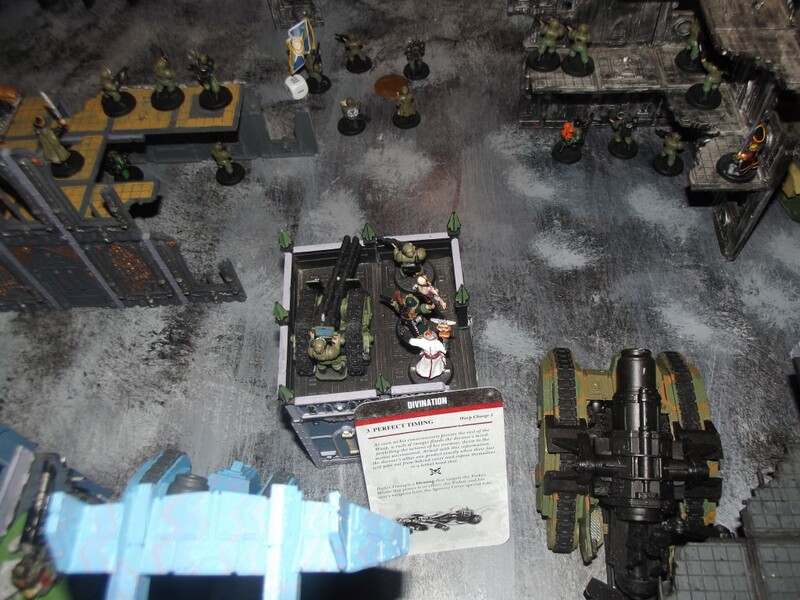 The Imperials seize the initiative. 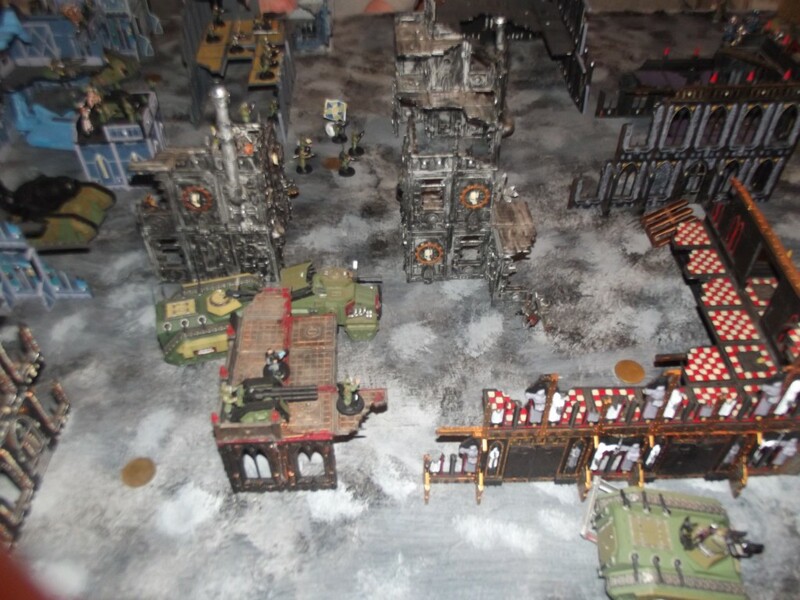 The imperial transport vehicles move up to try to slow down the forces of chaos. 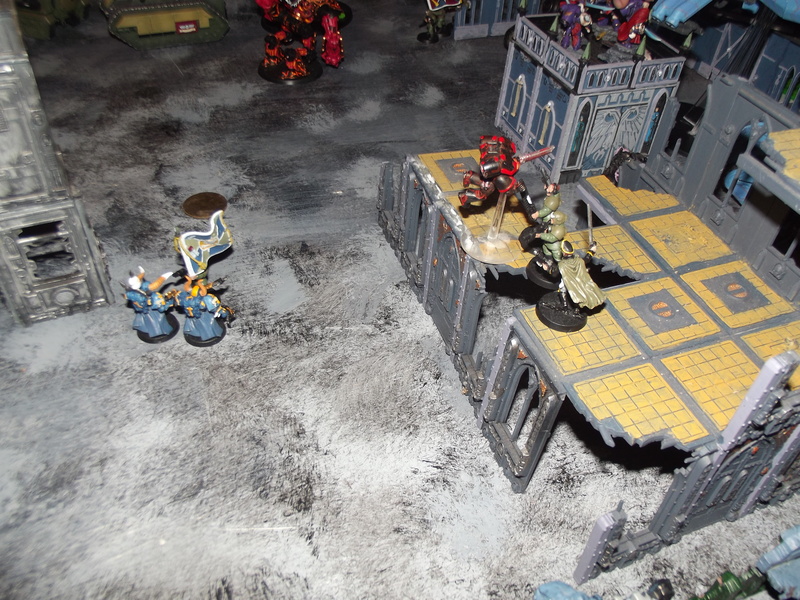 One of the command squads also moves forwards towards the central ruins. Psychic powers are cast giving the command squad a 2+ cover save. And the laser destroyer team Ignores cover. 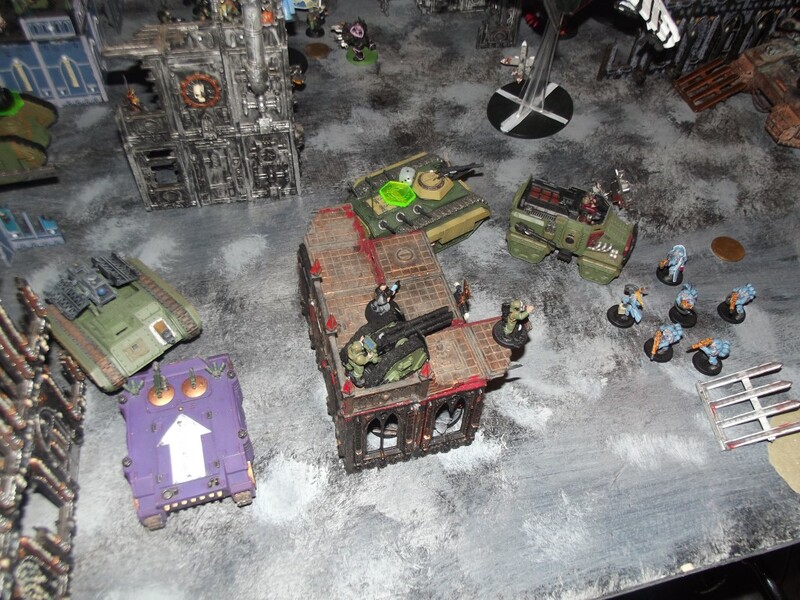 The imperial shooting phase tears four hull points from the baneblade, wounds on quad mortar cannon, and takes a hull points and shakes the crew of both the vindicator and sicaran. The deredeo also takes a hit and loses a hull point. 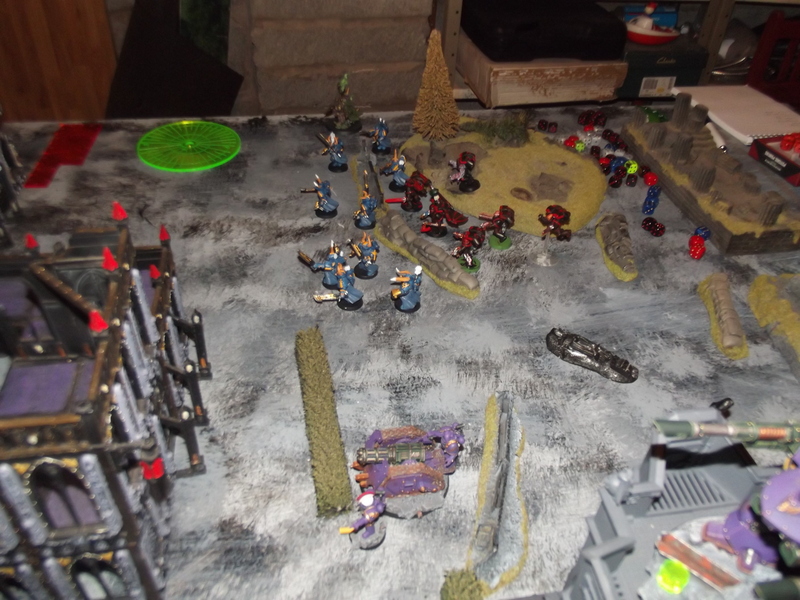 A whole cannon + 2 crew and 3 Chaos space marines suffer the attentions of the imperial guard artillery. Not wasting time all of the chaos space marine units move forwards as the decimator hugs the building ahead of its starting position for cover. 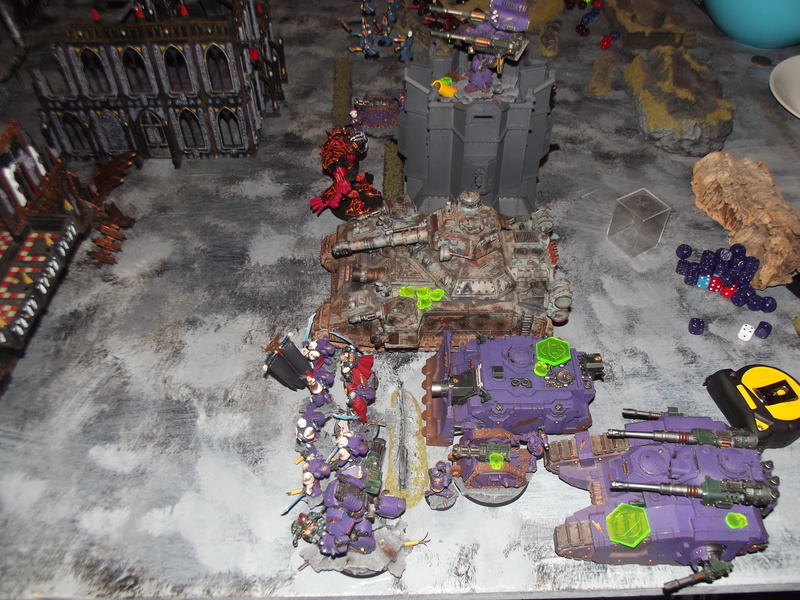 The Emperors children also move up with the baneblade trying to wreck the building ahead by ramming it. A 1 is rolled for its test and it takes another point of damage. The taurox prime is wrecked as the light shooting that chaos possesses at this range does little more than a couple of wounds to the rapier team[One man one on the gun], a single model from the unit in the yellow floored building (This was caused by the baneblade cannon) and a hull point from the bombard. 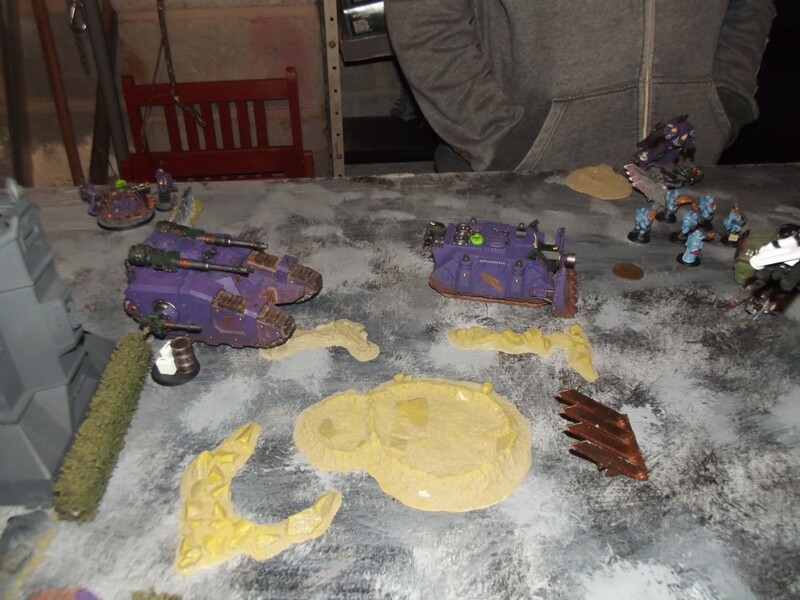 The contemptor cortus charges the chimera (taking a hull point and a crew shaken result in the process from the melta overwatch) and tears it apart. The explosion killing two more guardsmen. 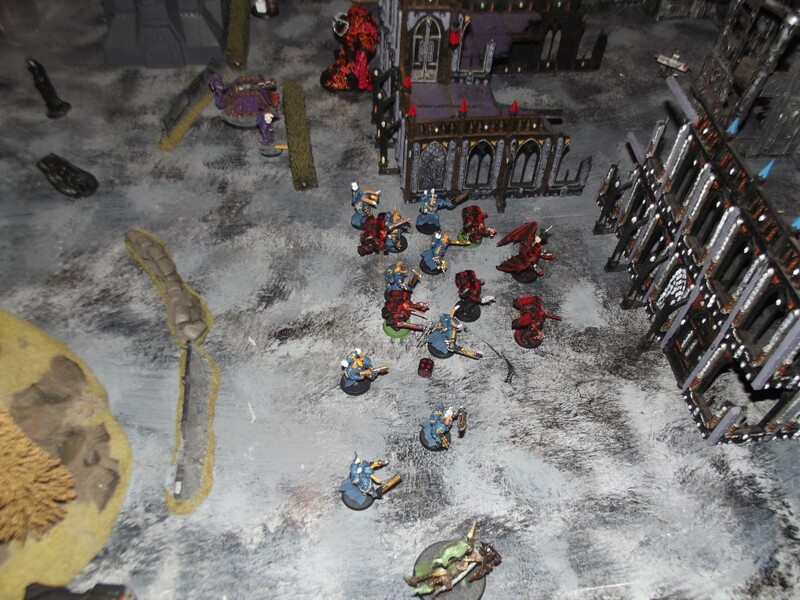 The chaos space marines and chaos lord set fire to two buildings with their flamer weapons. 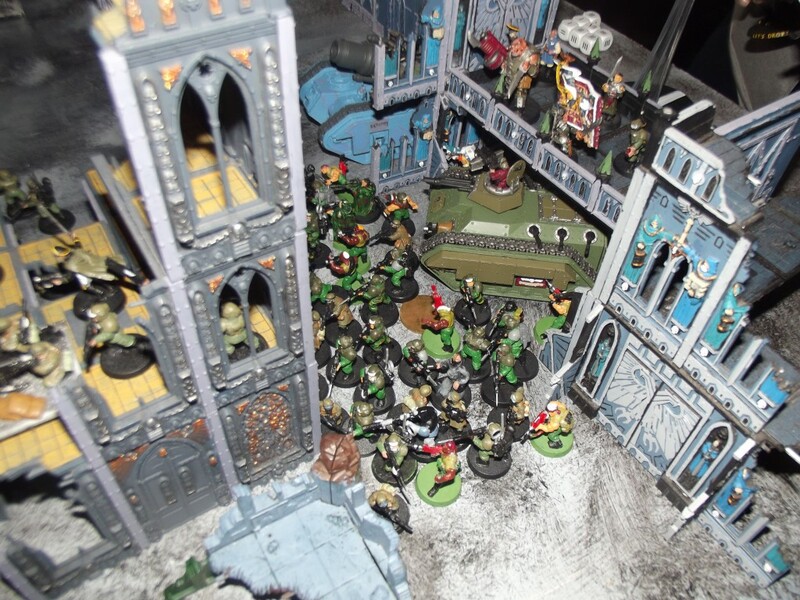 The conscripts emerge and fill the area between the buildings with bodies. A second infantry squad moves to reinforce this building. A second scion squad emerges from the sewers. 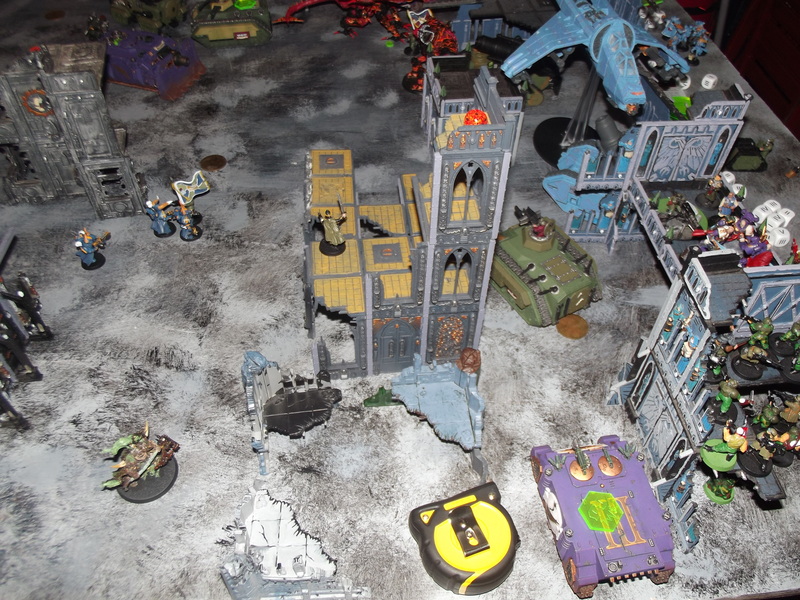 2 Raptors and 4 more chaos space marines are gunned down. 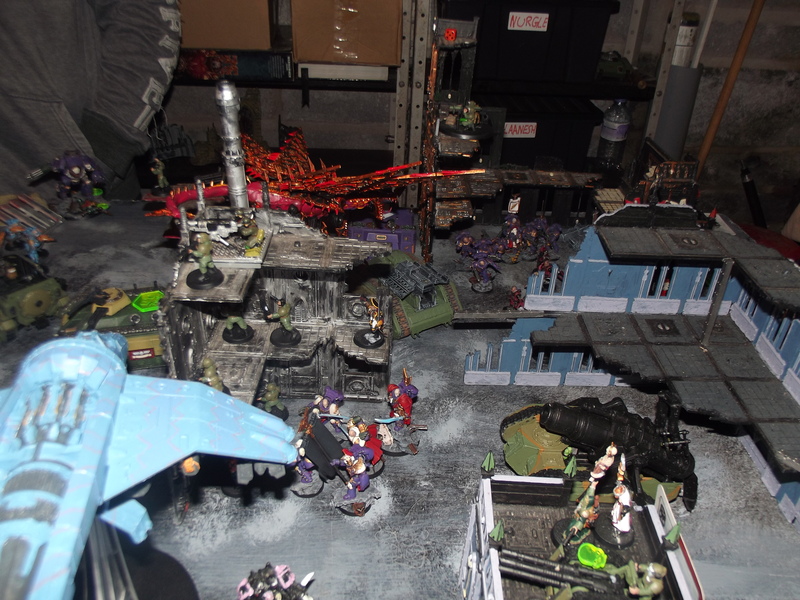 The heldragon flies onto the battlefield as the oblitorator deep strikes down onto the sewer entrance marker and the raptors and chaos space marines move to engage the scions. 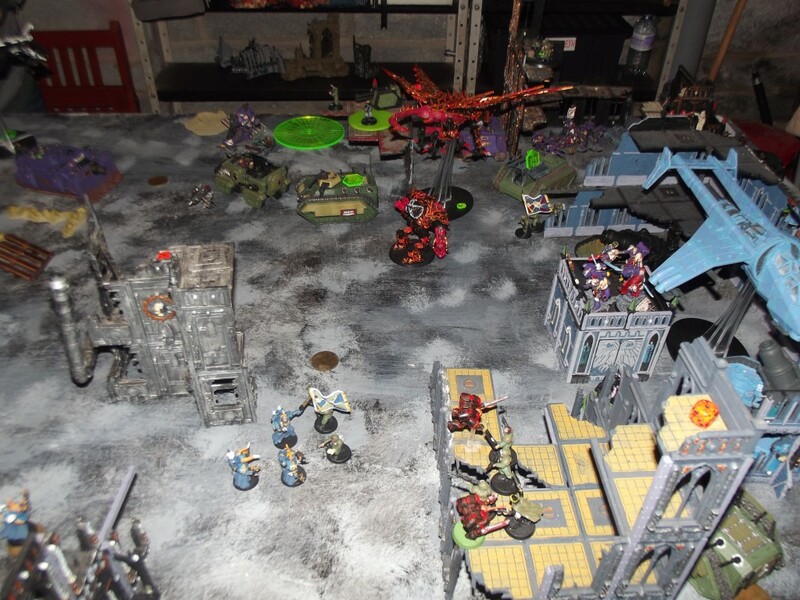 Having failed to kill it in their turn the melta squad prepares to face down the contemptor dreadnought. 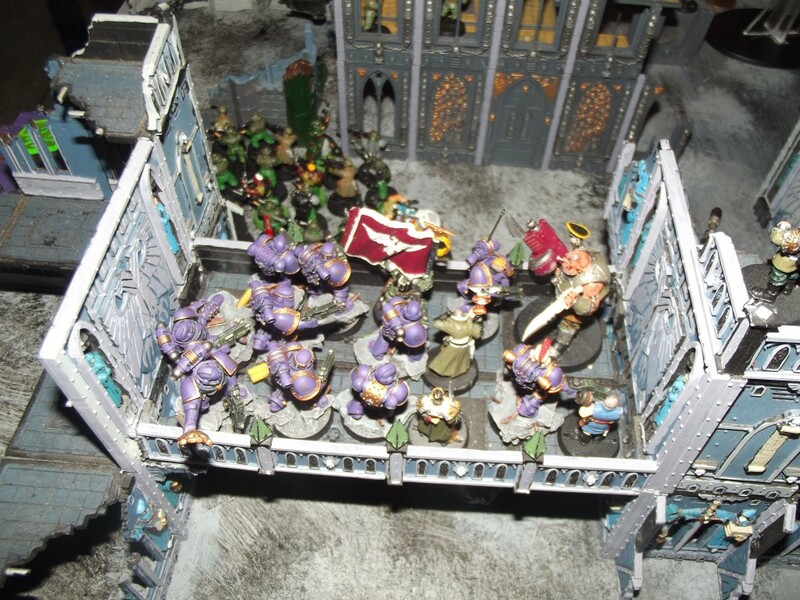 The emperors children command squad move deeper into the ruins. The baneblade is now on its last three hull points. 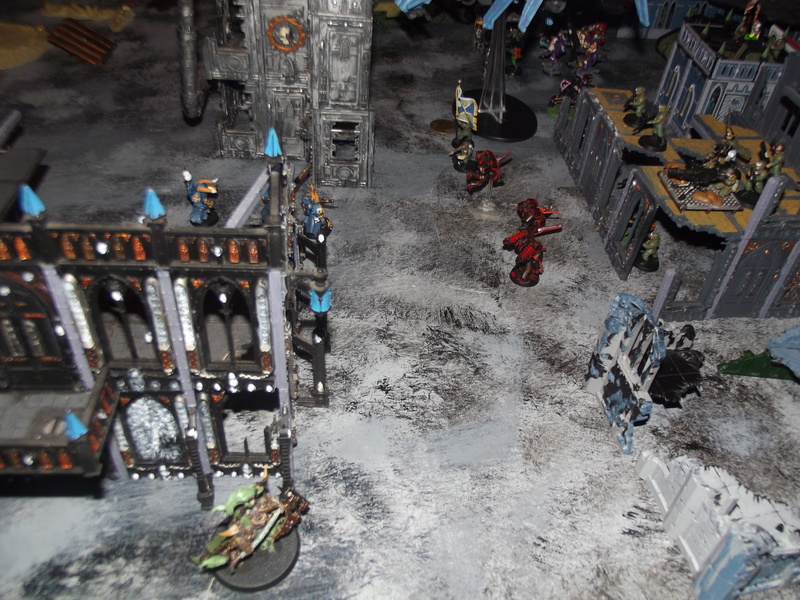 The Large building is wrecked and the scions are wiped out. 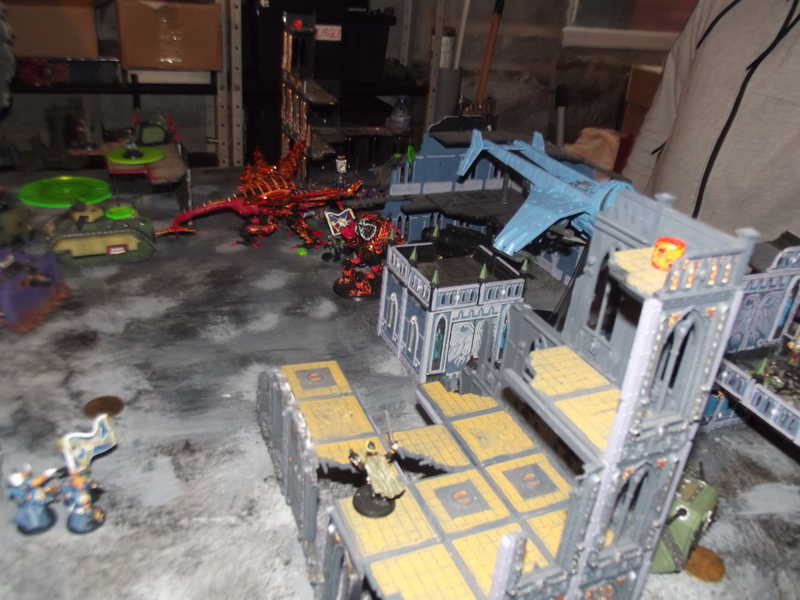 The heldragon kills three guardsmen while the chimera loses 2 hull points and suffers an immobilized result. 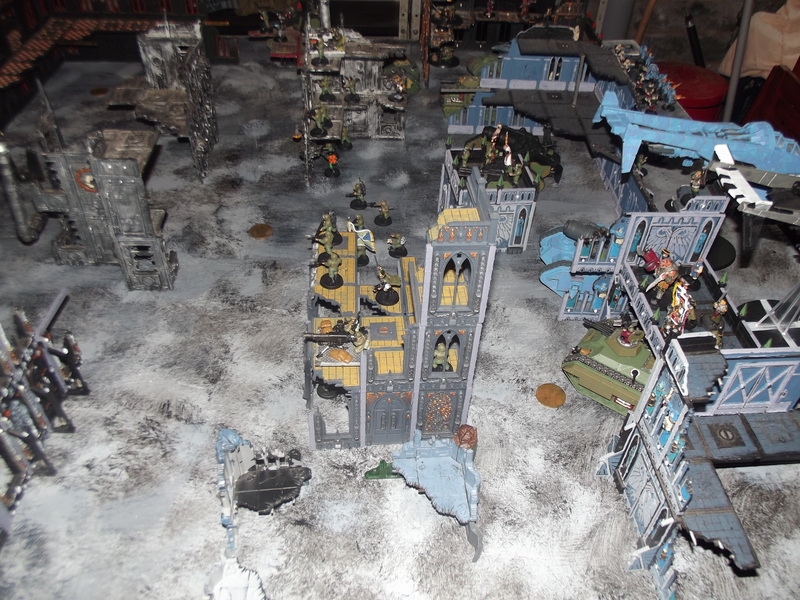 The newly arrived rhino and its marine cargo kill one missile launcher team and set the building on fire as a bonus. 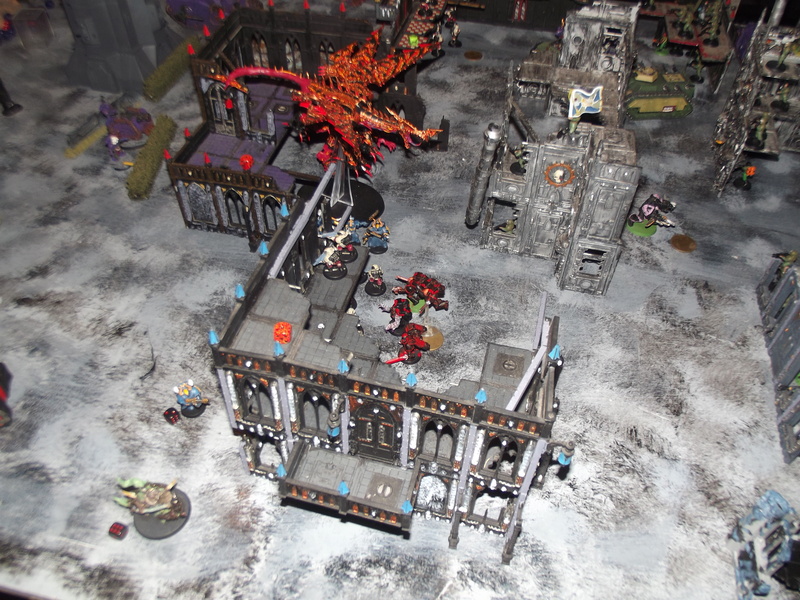 The oblitorator uses its heavy flamer and kills two guardsmen and sets the building on fire. 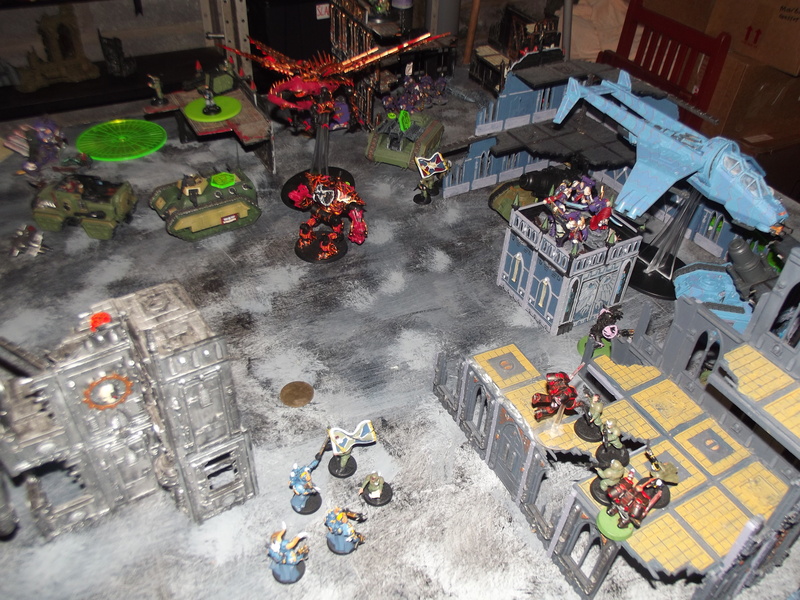 25 conscripts are slain through a combination of a bad baneblade cannon scatter and the flamers from the newly arrived veteran tactical squad. The green camo bombard is wrecked by the missiles from the deredeo. 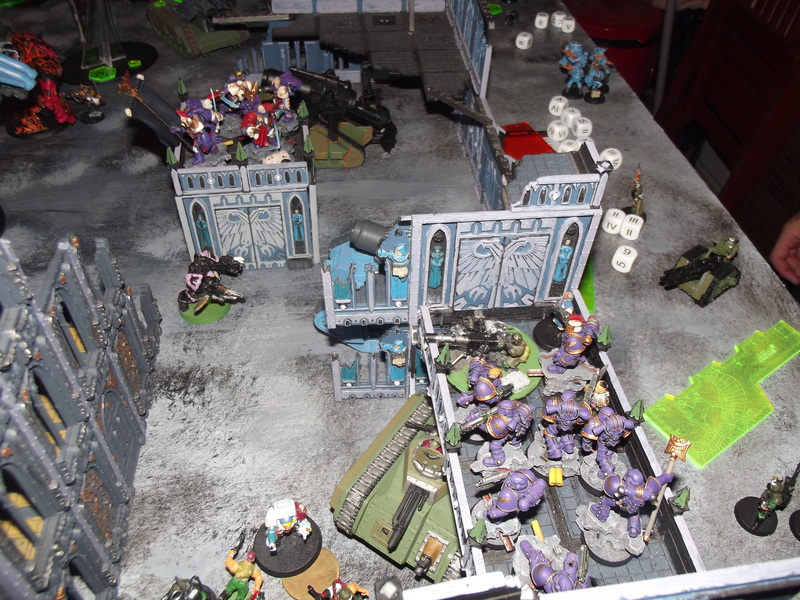 Despite losing a model to overwatch the emperors children command squad and praetor easily defeat the infantry squad they charge into. 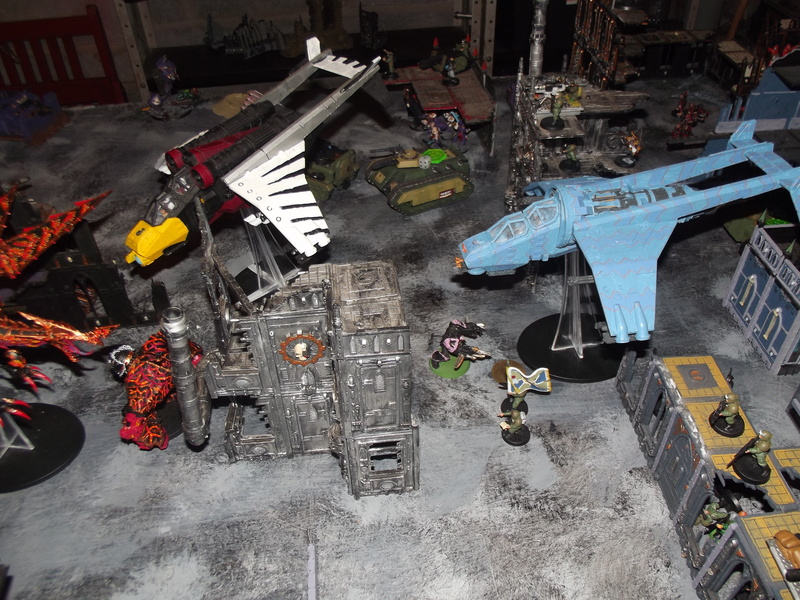 The vendetta and vulture fly in to provide the imperial forces with air support. The drop sentinels deep strike mishap and are placed in the far corner of the board. 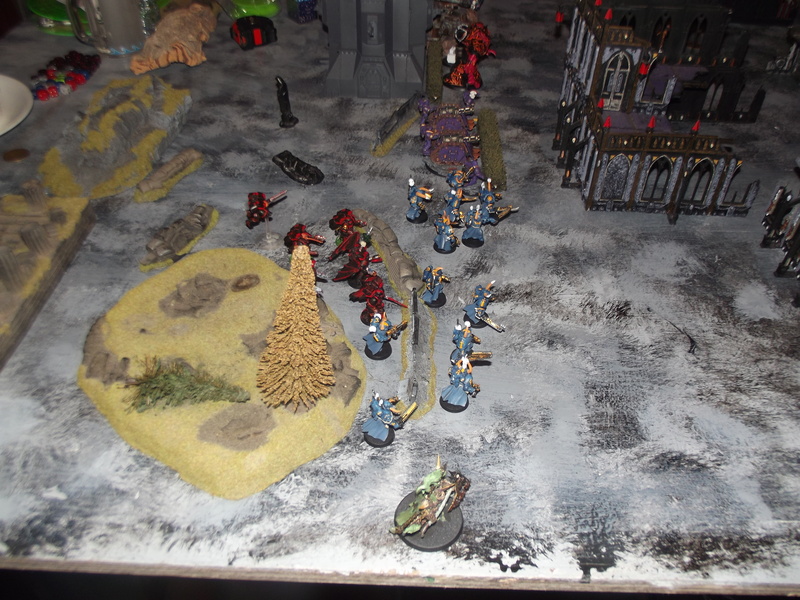 The inquisitor and Mr 12 join the conscripts as they take aim at the emperors children rhino. 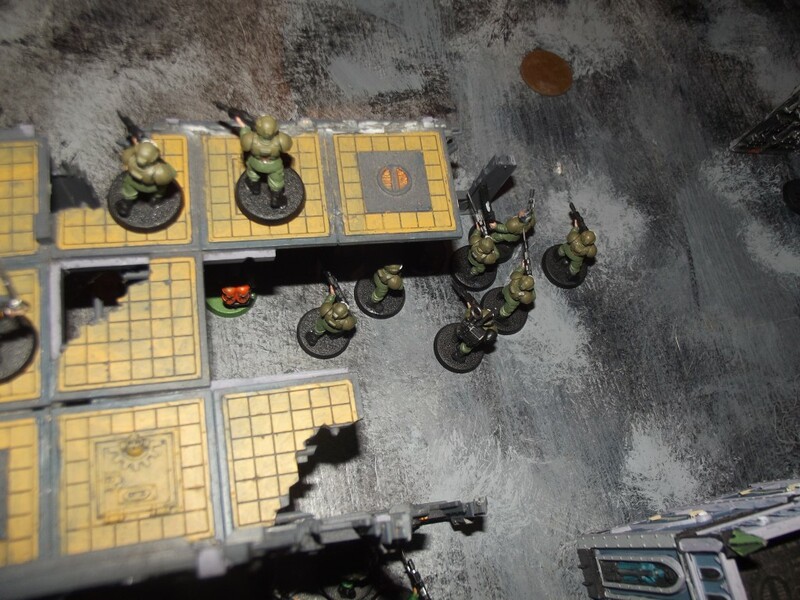 The scion command squad emerge from the sewers. 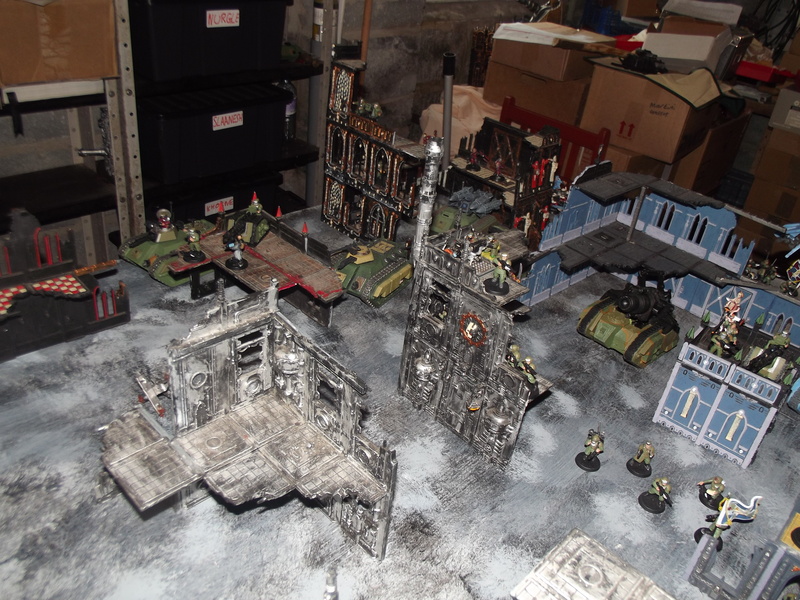 The baneblade is blown apart and its apocalyptic explosion scatters onto and destroys the already burning building in the centre of the table. The vendetta takes a hull point from and shakes the heldragon. 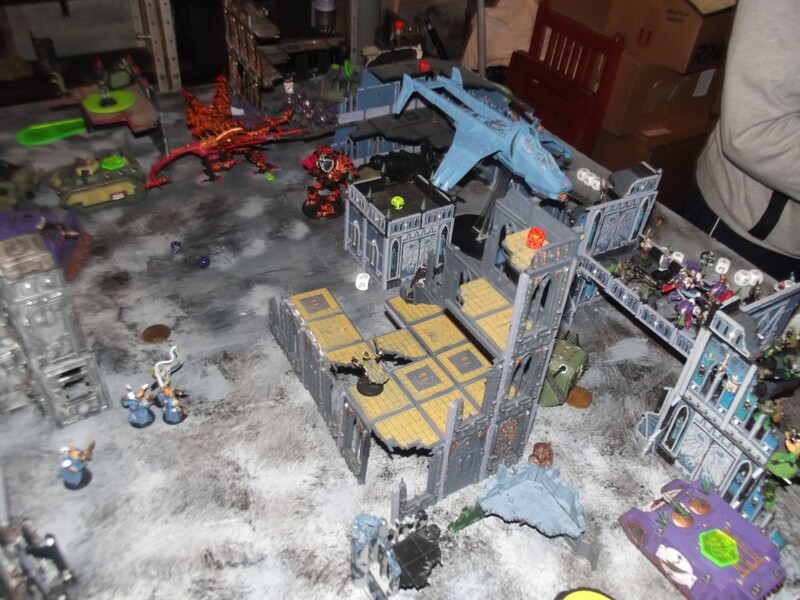 The vulture and scion command squad pour fire into the emperors children command squad and manage to kill one marine. The obiltorator loses a wound. 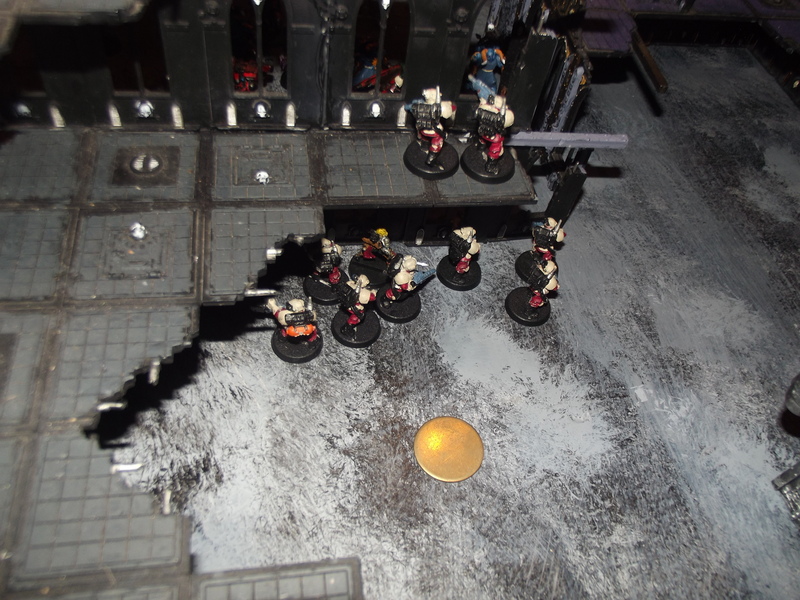 The burning buildings kill a missile team and their commissar. 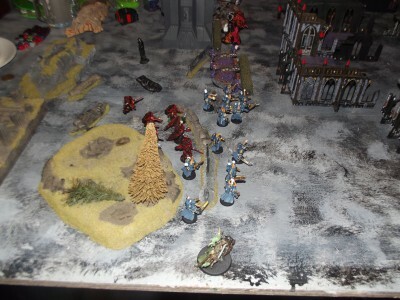 The chaos space marines and khorne raptors continue to advance with the nurgle terminator lord going on his afternoon stroll. 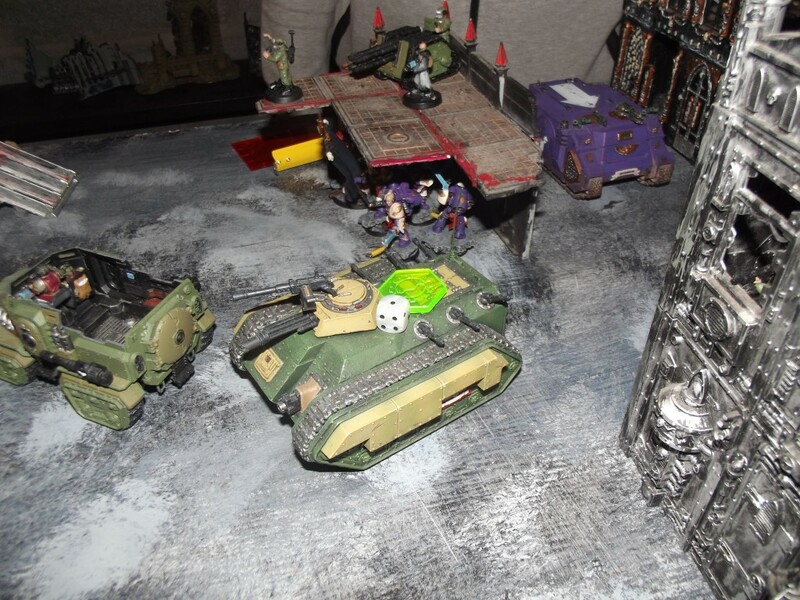 The emperors children veteran tactical squad jump out of their rhino as the heldragon wrecks the damaged chimera with a vector strike attack. 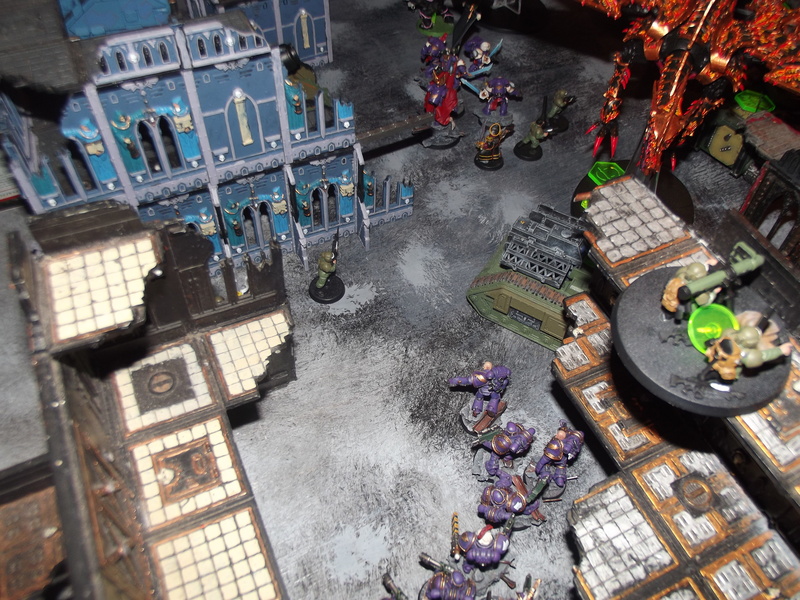 The emperors children praetor moves centrally with his squad. The sicaran and vindicator advance up to where the baneblade had been the turn before. The vendetta loses two hull points and its centrally mounted lascannon to the deredeo. The CSM squad have run to try and get closer to their target for next turn. 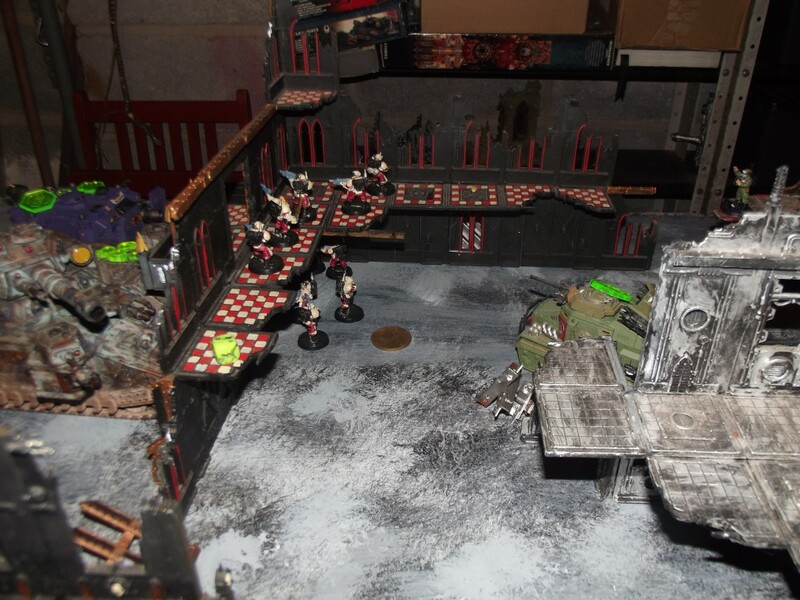 The central mechanicum ruin has been wrecked allowing access to the squad within. 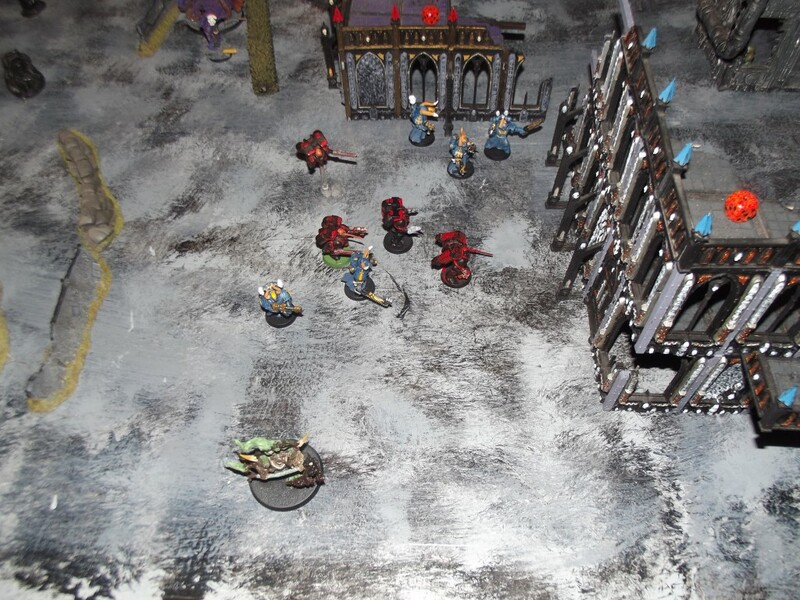 The tech priest and his servitors have been wiped out by the emperors children squad. The scion command squad suffer the attentions of the contemptor dreadnought. 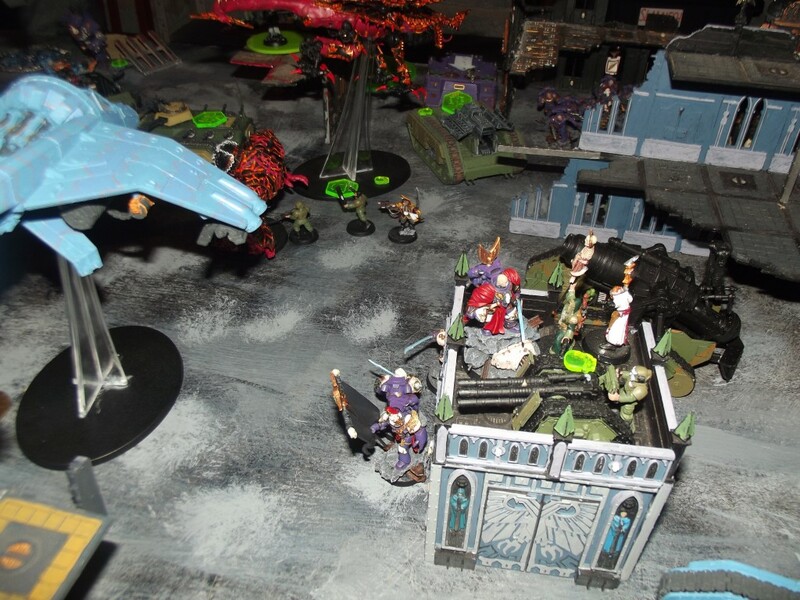 The decimator charges at the remanants of the central squad while Gyre charges the laser destroyer rapier team. 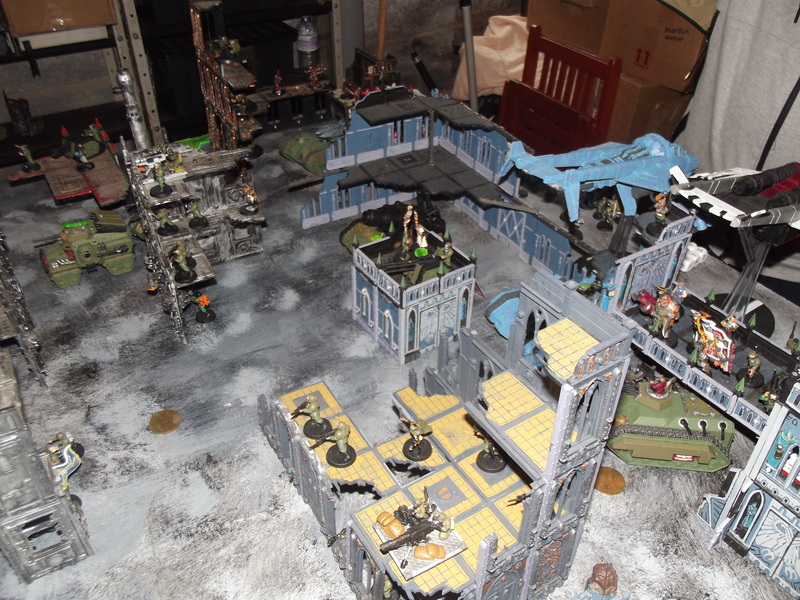 The oblitorator and raptor squad charge in to engage the imperial guard in the yellow floor structure. The emperors children charge in to mug the imperial guard command squad. 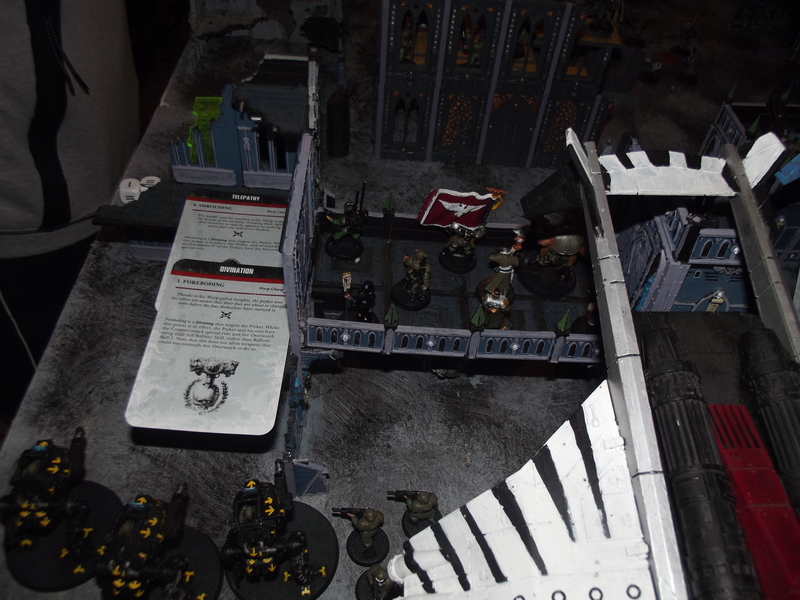 The commissar kills the Eternal warrior champion [lol] and two guardsmen fall to the raptors. Gyre has easily beaten his opponents. 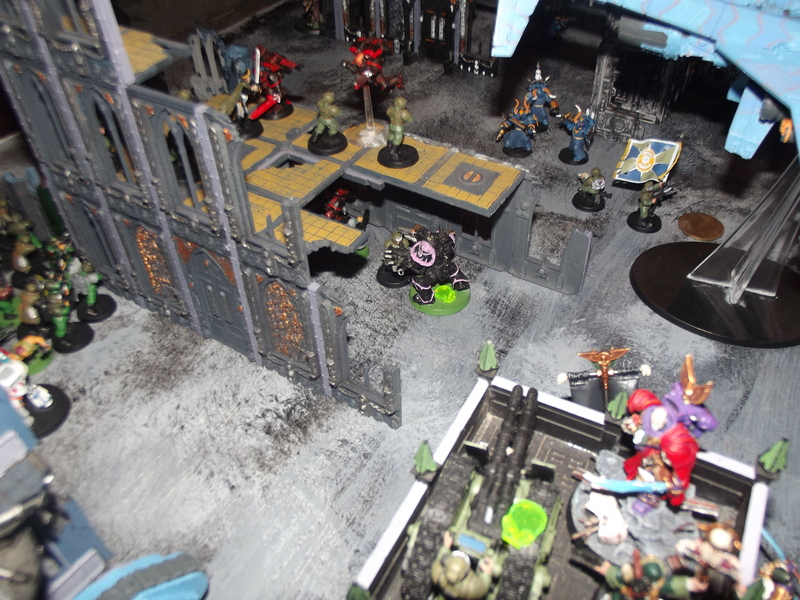 The preator easily kills the rapier team while the veteran tactical squad loses two men but manages to kill kell and nork with their attacks. 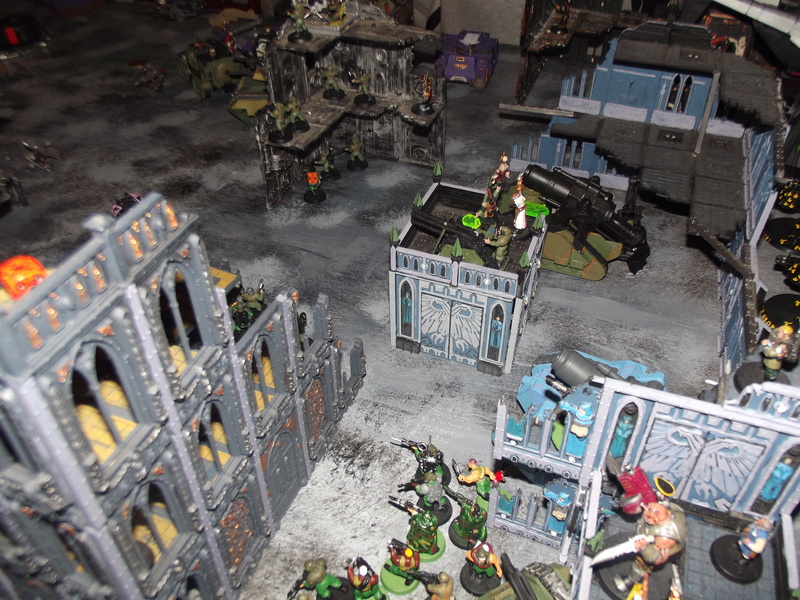 The vulture moves over the emperors children command squad aiming to punish them. 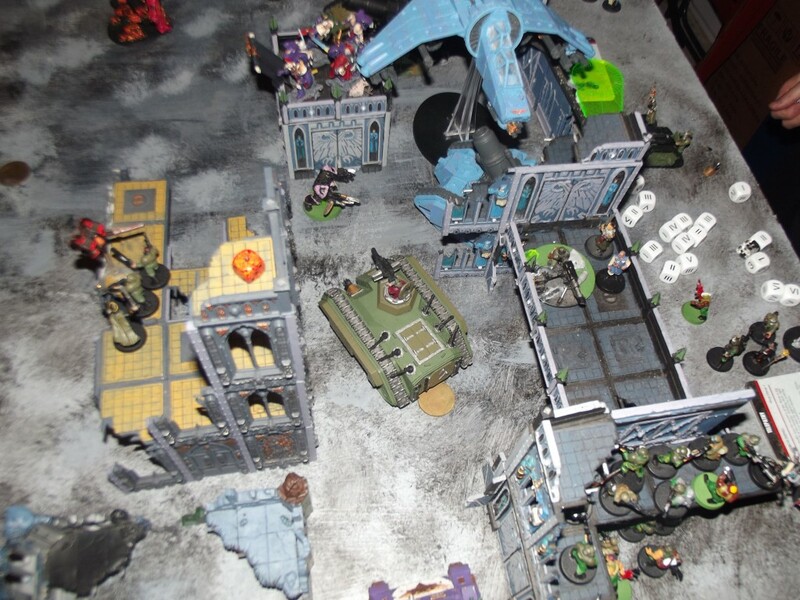 An imperial command squad move forwards to try to block the chaos forces from setting another building on fire. 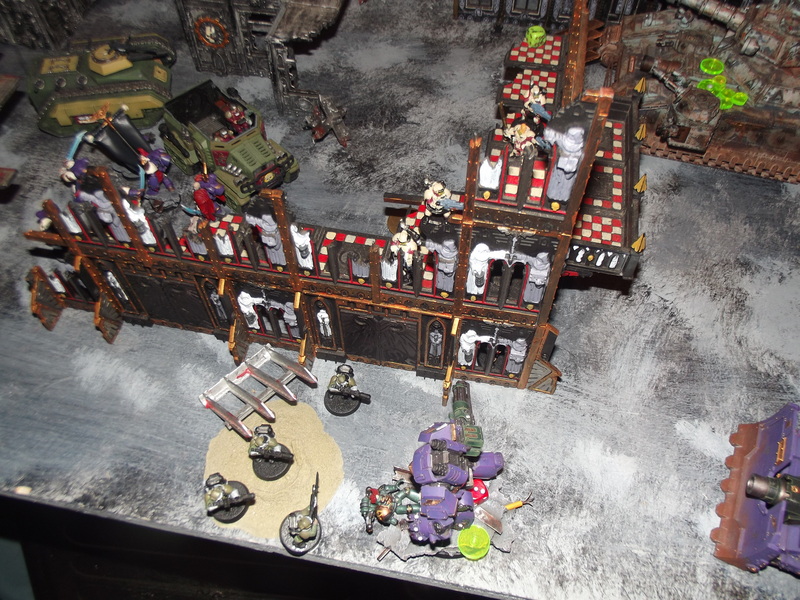 The contemptor cortus is wrecked and a quad mortar is silenced. Shooting was highly ineffective but the conscripts, inquisitor and Mr 12 rescue cavros thawne from the veteran tactical squad. 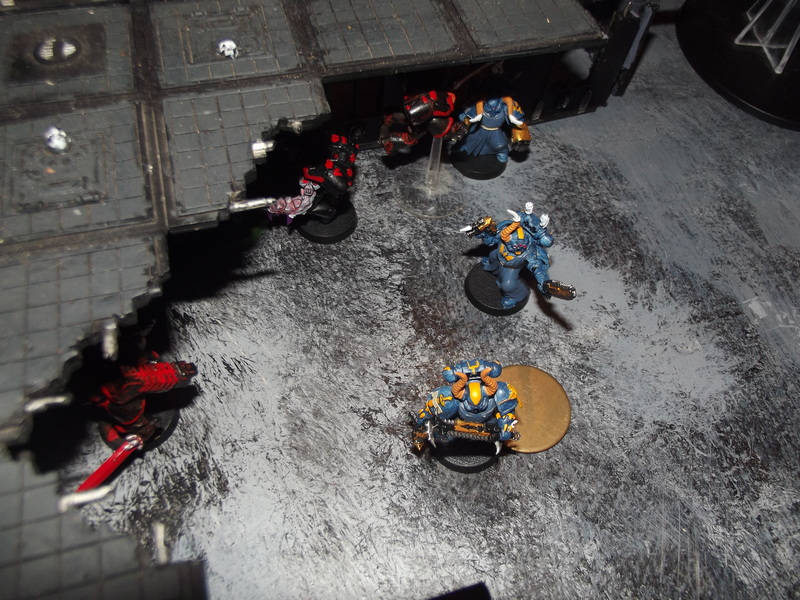 The inquisitor and veteran sergeant continue their double KO tradition and kill each other with power fist to the face tactics in their challenge. 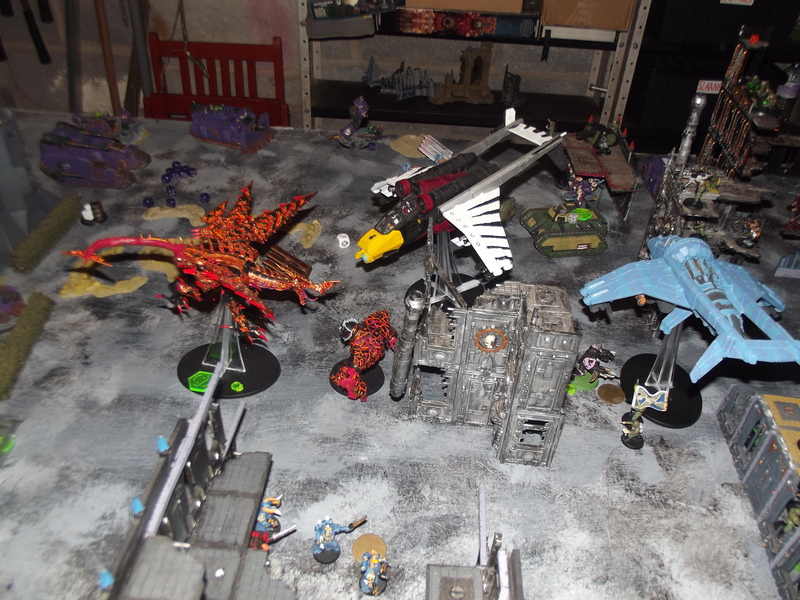 The imperial guard squad fighting the raptors kill one for a single casualty in return. 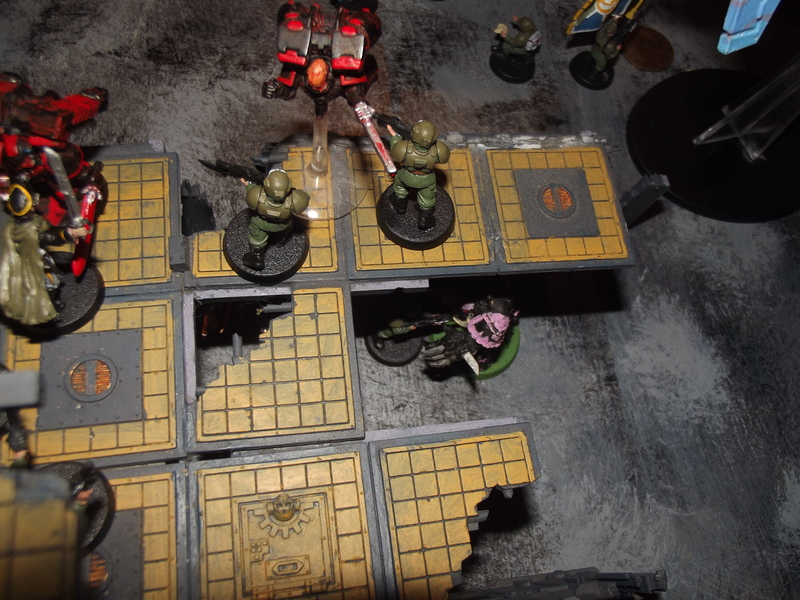 The raging fires kill the last raptor and the two imperial guard left alive in combat with him as well as the final missile launcher team. The decimator moves forwards and the heldragon drops into hover mode. Solomon gyre and his squad jump onto the balcony to engage Cavros thawne. 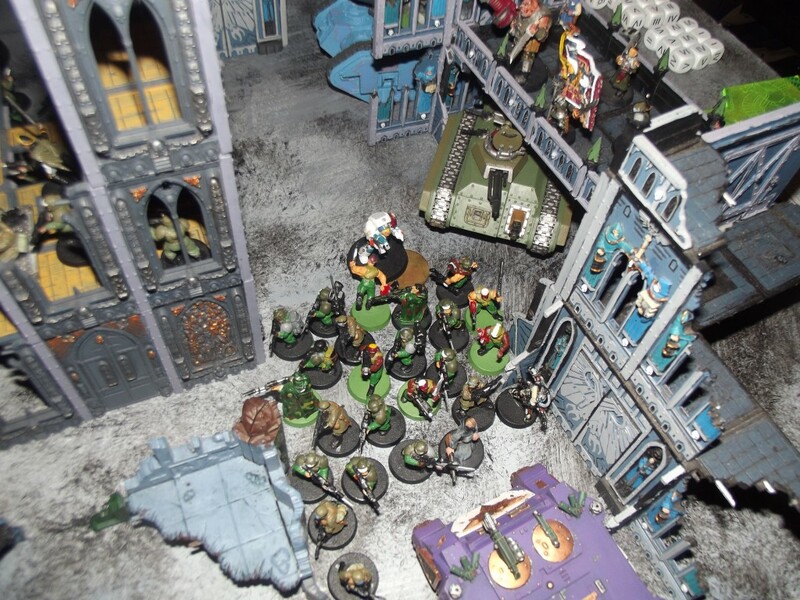 The Nurgle lord and final CSM continue their advance. Cavros looked up and then around. Thick black smoke obscured the sky from where buildings were burning. 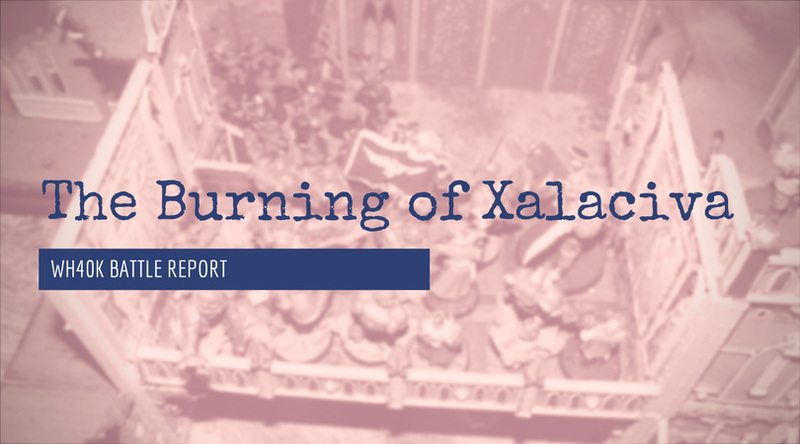 His forces had been broken and very few survivors remained. The time had come to fall back. His attention was drawn to the enemy commander as he and his command squad landed on the balcony nearby. Lord commander Solomon Gyre looked down at Cavros Thawne and chuckled. “There is no escape this time you imperial lapdog” He states. He dropped down through the nearby access hatch and into the top of his emergency chimera escape route. As he did this the Culexus assassin Mr 12 slammed into Solomon Gyre and pitched him off the balcony. The impact with the ground made Gyre black out for a moment. When he regained his senses his command squad stood around him and helped him up. “Where did he go!” Gyre snarls. The crackling of the many fires in the area could be heard as Gyre attempted to compose himself. A crunch sound was followed by further sounds as Vetul approached. The Baneblade was very underwhelming and did very little damage but seemed to draw the attention of the imperial player who did gain his 3 points for price of failure from its destruction. 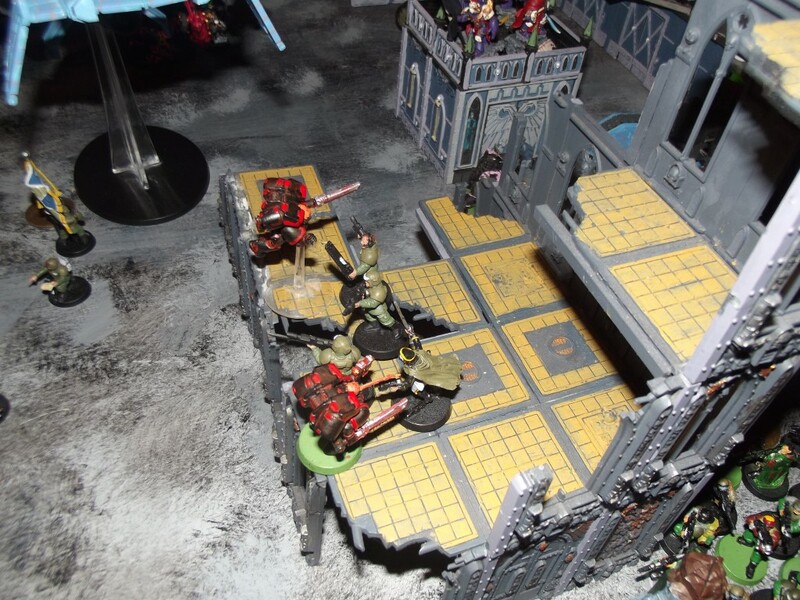 When removing imperial guard casualties bring a dustpan and brush. We really should have tested this mission more thoroughly before we ran through it. 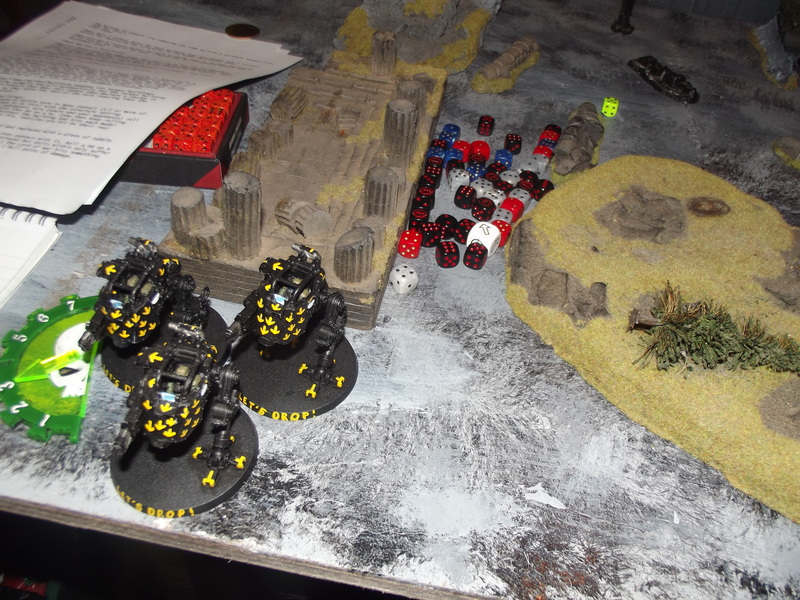 As despite discussing and clarifying the rules and victory conditions before we started and the imperial player wanted to include a method for his troops to be able to extinguish the fires [Mentioned last-minute as we about to play the game]. The upside to this has been that due to chaos winning all the missions since phase 2 bar the one that ended in a draw we have gotten to play a lot of the more interesting missions that were written up for this campaign. Next up we have the Blood sacrifice mission which does away with victory points and instead has a simple win/lose condition. 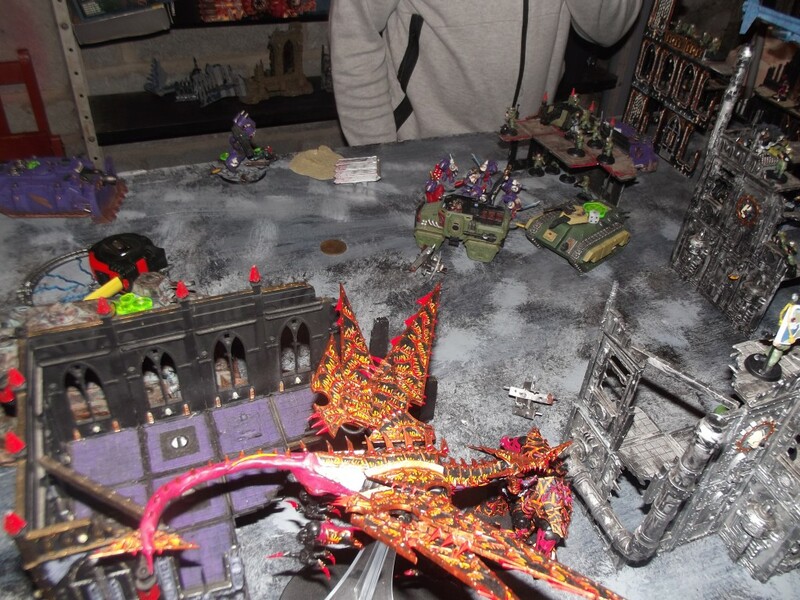 Then we move into the campaigns Endgame Apocaylpse>Battlefleet gothic>Smaller apocalypse game> Crown winner. Once completed a review of the campaign will be conducted where the aspects of it will be looked into and judged to see where we can make improvements in the future. As someone who has created a lot of missions over the years, there’s just some missions that are like that – unbalanced. It seems so far that you folks have had a lot of great, close matchups, so a goofy one won’t ruin the campaign by any means. Oh well at least its some lessons learnt for the next time we run a mission like this.